Roto North America is excited to introduce our NEW RotoFasco Secura 9600 Handle. The RotoFasco Secura sliding patio door line-up of handles continues to grow, creating new opportunities for Fabricators to strengthen their product offering. The 9600 handle provides a similar appearance to our current RotoFasco Secura 9900 handle, for a better/best segmentation. 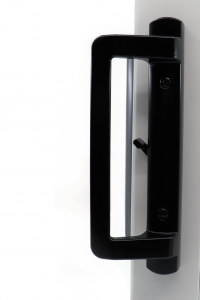 The 9600 handle is an entry level handle that features a contemporary look with a matching exterior design, with or without a keyed option. It is a 1-piece design that allows for ease of installation and is available in a variety of powder coat finishes. The 9900 handle is the up-scale, “big brother” to the 9600 for larger door applications. It is best suited to work in tandem with Roto’s 2-point Mortise Lock. It has a matching exterior design, with or without a keyed option, and is offered in a variety of powder coat finishes or a satin nickel architectural finish.